Daniel Walker (1772-1851) is a stubborn case of mine. Genealogy-wise, he's one of my most interesting men. On the run from the revolutionists in the US? Check. Heartbreaking story of betrayal by friends and countrymen? Check. Yet he continues to elude me by not providing any documentation that his son Joshua is the father of MY Daniel Walker (1825-1867). They were in the same area at the same time, named their kids many of the same names, but there's little to no paper trail of the familial relationship. So far investigations into land records and church records have failed, though I have one church left to cover: the Methodists. I placed Daniel (1772-1851) into a pile of "things to do" and figured it would come back at some point. I have the same pile with my knitting ::grins:: often putting things off because of a commission or on-demand knit with deadlines causes leisurely pursuits to go awry. Recently though, both "to do" piles have intersected yet again. I was contacted by another cousin who's willing to do the maddening work of discovering the paperless ancestor and go through what could be tangled identities of people with the same name in the same town. That also made me think about knitting socks, as Daniel Walker (1772-1851) was a proud Loyalist who would have worn stout handmade stockings that had been from the same pattern that was produced in England. 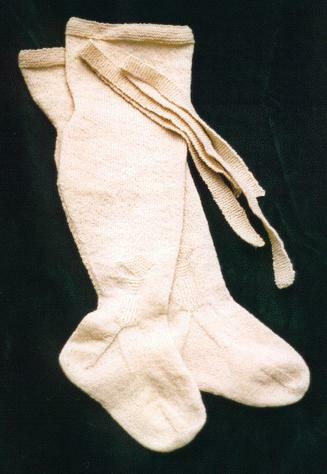 It was queried of the Loyalist Association what socks could have been worn during the time period and I sent on the reference that Donna Flood Kenton's "Hand Knit Hose" would have been a period correct stocking pattern. Her website has gone away over the years, but through the blessing of the Internet Archive, we can continue to use her pattern to this day. I have set about cleaning my craft room and found my pair of "socks in progress". I'm determined to make 2016 the year that we find my Daniel Walker and straighten out his family AND finish my pair of socks!